Kolkata: On the occassion of 71th death anniversary of Mohandas Karamchand Gandhi, alias Mahatma Gandhi, father of the nation, Hindu Mahasabha again reminded the people of India about Gandhi being assassinated by Nathuram Godse on January 30, 1948. 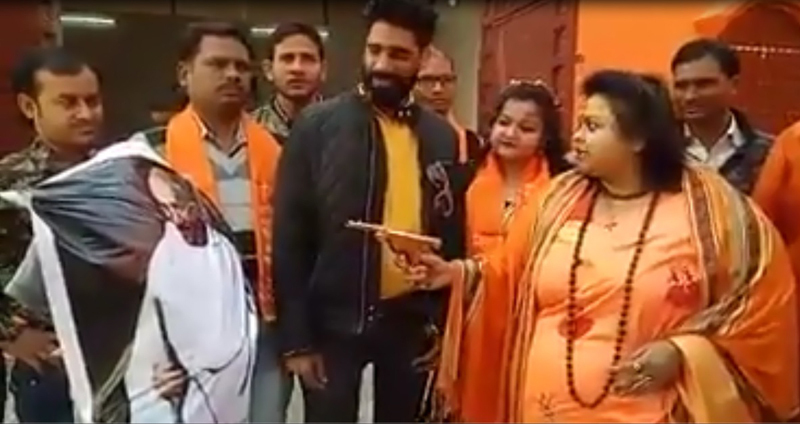 Office bearers and members of Hindu Mahasabha enacted the killing in Aligarh, by shooting on an effigy of Gandhi. As the effigy bled, they burn it. Surprisingly, this time a woman office bearer enacted the assassination and even had it recorded. They even chantedMahatma Nathuram Godse Amar Rahey (Long Live Nathu Ram Godse). Mahatma Gandhi, the 79-year-old leader, who led India to independence and taught non-violence and civil disobedience to the world, has been one of the tallest leader that the world has ever seen. He was assassinated by one of Hindu Mahasabha’s member Nathuram Godse within six months of India getting freedom from the British rule. Watch the video to witness how the killers of Mahatma Gandhi still feel proud of the heinous act of Godse.